Pig roasts have been popular for years, but Southern barbecue fans and the Cuban community of Miami enjoy grilling their whole hogs. Before attempting this feat, find a large, covered grill. The smallest pigs weigh about 75 lbs. -- almost four times the weight of a fully-stuffed Thanksgiving turkey. Once you’ve found a grill, find at least one strong friend to help you turn the beast. To clean and dress the pig, trust a pig farmer who has experience preparing pigs, meat locker or a specialty butcher. That just leaves you with the grilling. 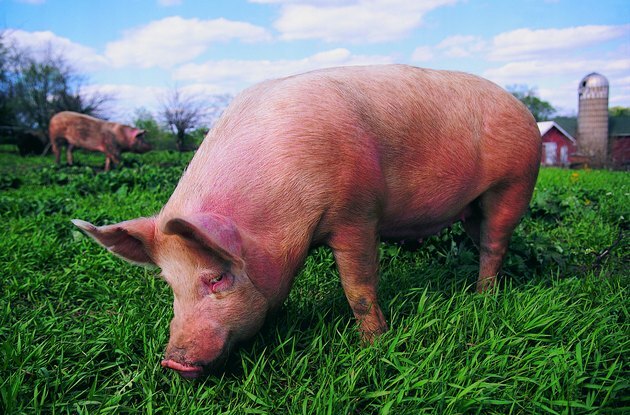 Bring the pig home in a strong plastic bag – some suppliers sell “body bags for this purpose. Keep the pig iced until time to start the fire, then lay it out to come to room temperature. Fill the grill with charcoal or wood and allow it to burn down to an ash-gray. If the grill uses propane or natural gas, adjust the heat to between 200 F and 250 F.
Lay the pig on its belly and rub oil on its back. Turn it over and liberally rub salt all over the inside of the pig. Set the pig on the grill rack, ribs down, set on the grill no closer than 12 inches from the fire. Cover and cook the pig at 225 F for 6 to 8 hours, depending on weight. Keep the grill lid closed. Check the pig’s temperature in its ham – the thick hind quarter – about an hour before it should be done. When the temperature approaches 160 F, slit the skin on the back along both sides of the backbone. Flip the pig by grasping under the ham and shoulder and gently rolling the pig over. This takes two people, one at the head and one at the end. Each turner must reach underneath and steady with a hand over the pig. If the pig separates along the backbone, repeat the motion with the other half. Do not try to turn a pig by grabbing its legs. Fill the rib cavity with a mixture of cider vinegar and brown sugar and a dash of hot sauce. Baste the entire pig with the vinegar sauce. Baste the pig several times until its internal temperature reaches 170 F in both ham and shoulder. Pull the grill with the pig on it out of the cooker and flip the pig over onto the serving board. Pull the hams and shoulders off to cut up on the chopping board. Remove the tenderloins that sit along the backbone and pull the remaining meat off the carcass. Dressed pigs weigh only 70 percent of their live weight. A 75- to 125-lb. pig can be wrangled by several people. Figure accordingly. Pigs should be butterflied for grill cooking. Ask the butcher or butterfly the beast yourself by cracking its backbone down its length. A pig rack makes turning the pig easier and holds it together when fully cooked. Make your own pig rack by weaving heavy wire into a two-sided fence-like basket. Instead of just salt, add chili powder, black pepper, cumin, oregano, paprika, thyme, or other combination of pork spices with garlic to make a spicy rub. Rub the meat with yellow mustard as a base for the rub. Pig cooking takes constant attention to avoid burning or loss of cooking heat. Use mitts designed for whole-hog roasting and wear them when handling the grill or the hog.